If you like your body shape you are either male or a very unusual female! However, whether you like your body or not, if you understand what your current shape and proportions are and know a few style guidelines for your shape you are well on your way to looking your best. Your horizontal shape is important for the clothing silhouettes and design elements that will book best on you. However, the other important proportion is your vertical body type. There are 3 of these: short legs long body; balanced body; and long legs short body. Your vertical proportion is important for the lengths of clothes (both for tops and for bottoms) that will be most flattering on you. Dressing to flatter your shape is one of the fundamental steps to looking your best. However, it is just 1 of 6 steps. Be sure to check out all of the 6 steps to savvy style to ensure you know all the fundamentals as well as how to build your own inspirational wardrobe. 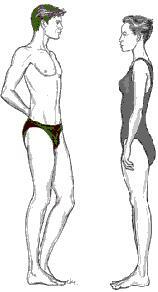 Get started by assessing your vertical body type and your horizontal body type (see below). What is the Perfect Shape? Luckily beauty is in the eye of the beholder. However, the current stereotype of the ideal female body shape is moderately tall with a body balanced vertically, an hourglass figure and an oval shaped face. For males the ideal is tall with a balanced vertical body and a trapezoid torso (that is, broad shoulders and chest tapering to medium waist and hips) and an oval face. So, You Don't Have The Ideal Shape? Not many of us do (only something like 2% of the population). However, you can create the illusion of a perfect body by choosing clothes to create the illusion of the ideal proportions. It's all about balancing your perceived shape to the ideal shape (or moving your appearance in that direction, anyway). For example, as a female, if you have long legs and a short, rectangle torso you can create the illusion of a longer, leaner, inverted triangle torso (the next best female shape). Do this by choosing tops that emphasize your shoulders and that flow through the waist, with a hemline between the lower hip to the tip of your fingers and with no horizontal seams across your torso. As a male, if you have short legs and a long rectangle torso you can create the illusion of longer legs and a shorter trapezoid body by choosing shirts that make your shoulders look wider and tuck in your shirt to make your torso look shorter (as long as your stomach isn't too big). Choose trousers that are darker than your shirt and shoes in the same color as your trousers, or darker, to make your legs look longer. Of course understanding your current shape doesn't rule out changing your shape through diet and exercise or, more drastically, through plastic surgery. The idea is to make the most of whatever shape you are now. If you do change shape by more than 5.5cm (2 inches) then you should re-assess your body shape and ensure your clothing choices still flatter your current shape. Start by assessing your vertical body proportions. This is the proportion of the bottom half of your body compared to your top half. Vertical shape is important for identifying your best garment lengths (tops and bottoms) and will come into play in determining if you should tuck-in tops or wear top garments un-tucked. 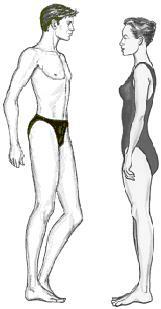 There are three vertical body types and these are applicable to both males and females. 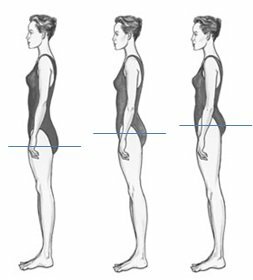 The most accurate way to determine your vertical shape is to measure your full height and the height to your low hip-line (your low hip-line is the circumference around your hips where your bottom is fullest) and determine where your hip-line comes in relation to your height. Your main style aims are to create the illusion of longer legs and a shorter torso. If you are less than 160cm (5'3") with a small to medium body scale then you are also petite. Your main style aim is to elongate your mid-torso. Your main style aims are to create visual balance by creating the illusion of a longer mid-torso and shorter legs. Before you can dress for your shape you need to understand what your shape and body proportions are. 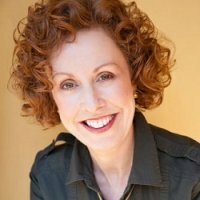 For professional help, either in-person or online, use my image consulting services. Your horizontal shape is the relationship between your chest, waist and hip-line. It is their relative proportion to each other that is important rather than their actual size. Your horizontal body type is used to identify the clothing styles that will suit you best. Although it is important to note that other factors can change some of these recommendations, such as face shape, neck and shoulder size and prominent features. If you are male identify your horizontal body shape here. If you are female identify your horizontal body shape from the pictures and descriptions below. To do this assessment stand in front of a full length mirror. A long straight object such as a long ruler or a broom handle will also be useful to work out whether your hip-line is narrower, wider, or the same width as your bust-line. The easiest way to see this is to hold the ruler under your arm pit, in-line with your shoulder joint, and rest it on your hip. Select the link on your horizontal body shape, below, to find out the general style aims and specific dos and don'ts for your horizontal body type. Check the general style guidelines for your hourglass figure by clicking here. Get personalized style recommendations that take all of your body proportions into account by clicking here. Check the general style guidelines for your inverted triangle figure by clicking here. Check the general style guidelines for your triangle figure by clicking here. Check the general style guidelines for your rectangle figure by clicking here. You may have "love handles"
Check the general style guidelines for your oval figure by clicking here. Check the general style guidelines for your diamond figure by clicking here. Still not sure which shape you are?